Has the Internet been good or bad for society? Has it helped or hurt individuals? Does it lead to positive or negative interactions? Has it made relationships with friends and family stronger or weaker? Thanks to the Pew Research Center’s Internet & American Life Project, we finally have some answers to these frequently asked (and often-debated) questions. By a 76%-15% margin, American Web users say the Internet has been good for society rather than bad for it, and another 8% believe it has been both good and bad. 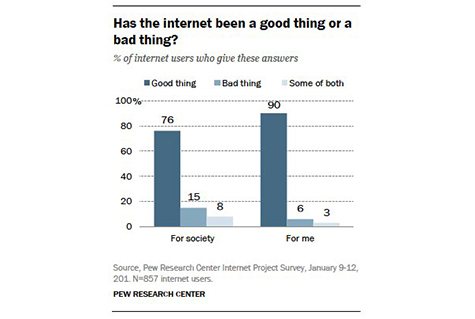 90% say that overall the Internet has been a good thing for them personally and just 6% say it has been a bad thing. 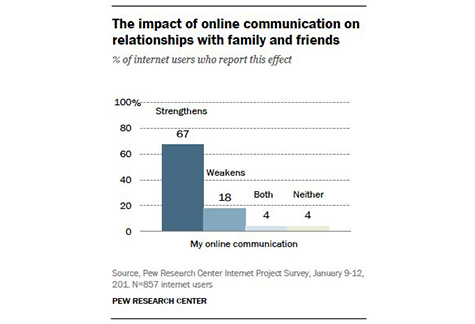 67% of respondents say their online communication with family and friends generally strengthens those relationships, whereas only 18% say it generally weakens those relationships. 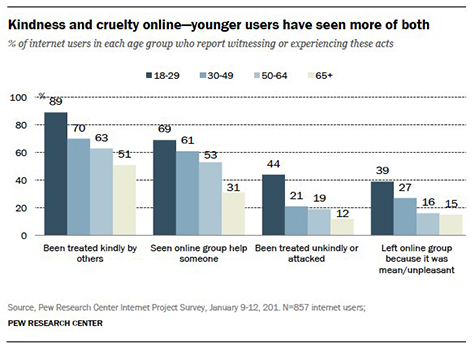 70% of respondents say they have been treated kindly by others online. That compares with 25% who say they have been treated unkindly. 56% say they have seen an online group come together to help a person/community solve a problem. That compares with 25% who say they have left an online group because the interaction became too heated or members were unpleasant to one another. Internet users 18-29 are more likely than their elders to have been treated both kindly and unkindly and to have seen people band together and people attack each other online. 53% of respondents say the Internet would be, at minimum, very hard to give up, compared with just 35% who say the same about television. 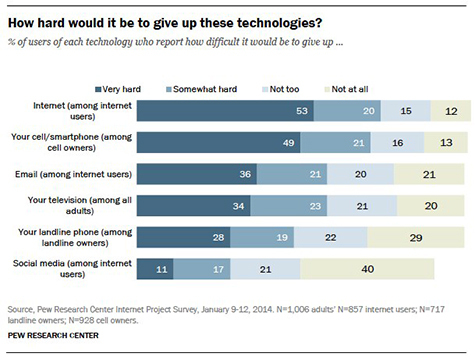 Among technologies, only cell phones would be nearly as hard to give up as the Internet (49% of respondents). 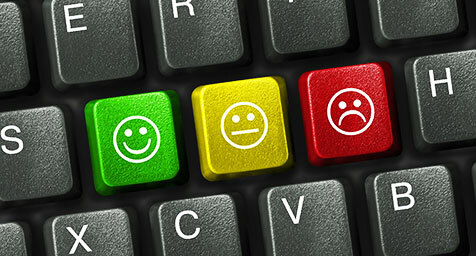 Ultimately, the data shows that Americans generally have a very positive view of the Internet—with the vast majority seeing it as something that has enabled better communication and helped build communities. The numbers also show that the Web has become deeply intertwined with most people’s lives, which means digital marketing channels should be viewed as fully mainstream as well. After all, if something is viewed as being more essential than television by most Americans, then it must be here to stay. Discover how digital marketing can make a major impact for your brand. Contact MDG Advertising today at 561-338-7797 or visit mdgadvertising.com.